Calculations at a half tetrahedron. This is a regular tetrahedron which is cut into half, so that a long wedge with a square base is formed. 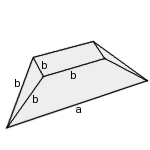 One edge a of the tetrahedron remains, the other eight edges b have half the length. Enter one value and choose the number of decimal places. Then click Calculate.